Although a rainy day at the Tiffin Centre in Barrie, the sun shone for less than fifteen minutes after Lorrie and Marc's wedding ceremony, which was an otherwise rainy day. As a Barrie wedding photographer, it is not only my task to create beautiful images of scenes happening before my eyes, but also to make experienced suggestions as to where the best locations may be for important moments of a couple's day, including family/bridal party portraits and photos of the two of them. I certainly made the most of Mother Nature's gift by running up to the top of the hillside where there would be the fewest trees obstructing the sun, thereby giving us the longest possible time to craft some unique wedding photos! The Tiffin Centre has some of the most spectacular opportunities for wedding photography, with some trees being more than a century old and towering several stories above ground. 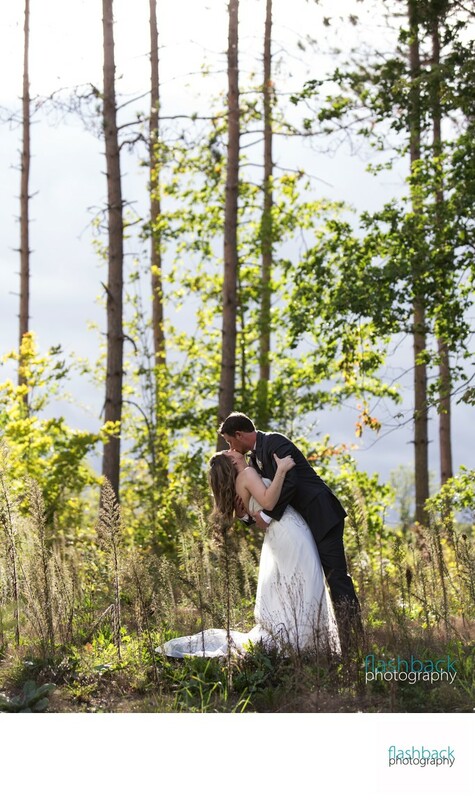 A vertical composition for this photograph emphasized the height of the forest while the straight vertical tree trunks draw attention down to the married couple sharing a moment together following their ceremony.